4 x 4" 6 x 6" 8 x 8"
Small Pistachio Gourmet Folding Boxes with attached grosgrain ribbon by the carton. Each grosgrain tie is 9-1/2" long. Listed dimensions are the exterior dimensions. Folding Gourmet Gift Boxes are square rigid boxes that store flat and pop-up for easy assembly. 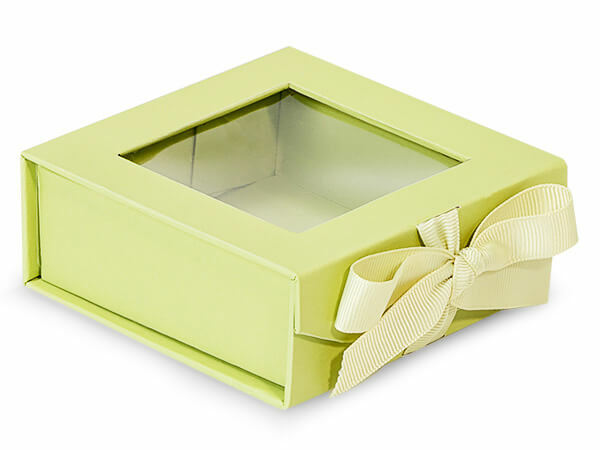 Boxes feature clear window lid on top of box and coordinating grosgrain ribbon closure. Great for showcasing your gourmet food and other products. Foldover acetate lid has magnet to secure closure! We recommend a food safe barrier such as a clear cello sheet, a cello bag, or waxed food grade tissue rather than packing these boxes for direct food contact. Add our candy trays, pads or cups for candy packaging.